A larger, hand-tinted version of the above photo used to hang on the wall in my grandparents home and is now with my Aunt. I’d always been curious to know more about my grandfather’s experiences during the First World War but he would never speak about it. I was later able to obtain a copy of his army service records which showed that during the First World War he served as a gunner in the Royal Field Artillery, seeing action in Alexandria (1915-1916) and France (1917-1919). 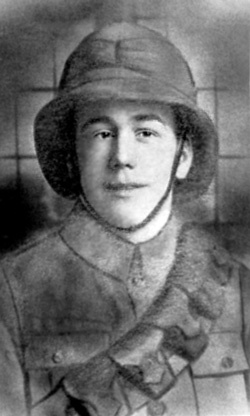 At the end of the war, Sam received the British War Medal and Victory Medal and following discharge from the army he found employment at the Vine Chemical Works in Widnes. He married Elizabeth GIBSON in 1929. Sam died at his home in Widnes in 1977. * For the story of John MADDOCK’s connection to the HOUGHTON family, see my page on the CUMMINGS. Samuel HOUGHTON, Head, 25, General Labourer, b. William St. I obtained a full copy of the above certificate, which shows that Samuel was a labourer, 21 years old and living at 101 Midwood St. Widnes and that Elizabeth was 20 years old, living next door at 103 Midwood St. Samuel’s father was James HOUGHTON and Elizabeth’s was George CUMMINGS. The witnesses were William James MARTEN and Isabella CUMMINGS. Two houses away at 14 William Street is the family of William Houghton, also born in Newton. The fact that in 1871 (Liverpool), 1881 (Widnes) and 1891 (Widnes), James and William’s families have lived very close to each other, and both were born in Newton, strongly suggests to me that they are related and probably brothers. This suggested that Jane could be Ellen’s sister-in-law (i.e. William’s sister) so I looked for the marriage of Thomas BUNN to Jane HOUGHTON and found it in the IGI (1870, All Saints, Runcorn). I ordered a copy of the certificate and Jane’s father was James HOUGHTON, labourer. Summarising so far, my great-grandfather Samuel HOUGHTON was born c. 1876 in Widnes and his father was James HOUGHTON. James, who was b. c. 1835 in Newton, may have had a younger brother, William b. c. 1837 in Newton and William had a younger sister Jane b. c. 1841, also in Newton. We know that Samuel’s father James HOUGHTON married Elizabeth WALKER in 1856 at Frodsham Parish Church, near Runcorn and James stated that his father was Thomas HOUGHTON (deceased); Elizabeth gives her father’s name as James WALKER (deceased). I ordered copies of the birth certificates for Henry and Jane and for both, their parents were James HOUGHTON and Alice HARDMAN. If this is the correct family then the presumption is we have an Alice HOUGHTON who was widowed and subsequently married Thomas WOODCOCK, sometime after 1841 (birth of Jane) and before 1846 (birth of Alice). I searched for and found Thomas and Alice’s marriage in 1845; Alice HOUGHTON was indeed a widow (her father’s name was given as James ORRED, weaver). 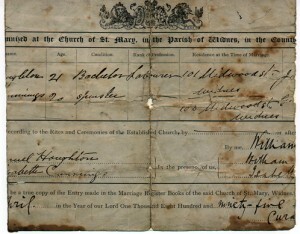 I also obtained a copy of young Alice WOODCOCK’s birth certificate; her mother is Alice WOODCOCK, formerly HARDMAN which ties in with the above. And finally, Lynn recently provided me with a copy of a death certificate which we believe might be that of our James HOUGHTON; James died on the 21 January 1902 at 7(?) Albert Square, Widnes. He was 68 years of age and was a chemical labourer. The informant was his son, S. HOUGHTON of 16 Bower Street, Widnes. Hi, I came across your website when I typed in John Houghton of Bowdon in Google! I bought a desk at a local auction in Mold and found a letter to John Houghton which had accompanied a cheque from Associated British Maltsters of Newark-on-Trent dated 1930.